In Teaching, Pink Slips Are A Way Of Life : NPR. P.S. One thing that I’m learning in education is that rules that help the adults are often detrimental to the students. From the ‘Flypaper‘, Mike Petrilli presents some startling findings… charter start-ups are more likely to have better student outcomes than comparable district schools. Now it is worth noting that the success rate is kind of low (charters are 19% made the state benchmark for success versus 5% for the public schools, which is no good, but it is better. There are some caveats that need to be noted, but this is a good charter story to share. If charters are seeing some successes in areas where public schools are not, this might be a better expenditure of tax payer dollars and an easier way to help hurting neighborhoods vis a vis helping their children obtain a sound education. 19% is low, no doubt about it, but it’s better than 5% and means all the difference for the hundreds of school children that it impacts. Worthwhile of a full read. An analysis released in today’s Education Gadfly finds that new charter schools in disadvantaged communities are almost four times as likely to reach above-average rates of student achievement as the closest district school. This raises serious questions about the wisdom of the federal government pumping $3 billion into school turnaround efforts instead of using some of the money to replicate and scale up successful charter models. However, the finding comes with several big caveats. First, because of the small sample size, the results cannot be deemed statistically significant. And second, it’s impossible to know whether “selection effects” played a role–whether the new charter schools performed better because they attracted better students. The analysis was by David Stuit, a Vanderbilt PhD. who authored a previous Fordham study on school turnarounds last December. The idea for this analysis came from Public Impact’s Bryan Hassel. After the release of our December study–which found that just one percent of district and charter school turnarounds were successful, as defined as reaching at least the 50th percentile in state proficiency in reading and math–Bryan wondered whether charter start-ups in similar neighborhoods would fare any better against such rigorous criteria. Across ten states (Arizona, California, Florida, Michigan, Minnesota, North Carolina, Ohio, Pennsylvania, Texas, and Wisconsin), I located all incidents (between 2002-03 and 2006-07) of a charter school opening in close proximity to a district school that had reading and math proficiency rates in the bottom 10 percent of its state at the time the charter appeared in its neighborhood. To qualify as a fair match-up, the charter and district schools had to be the nearest neighboring public schools of the same type (elementary or middle) and be located less than three miles apart as the crow flies. The schools also had to be demographically similar, with no more than a 10 percentage point difference in their subsidized lunch and minority enrollments. After identifying these matches, I examined the reading and math proficiency rates of the schools in 2008-09 to determine how many schools had become “successes” by that year (success defined here as performing above the state average). And sure enough, the charters did better–a lot better. He found 81 pairs of schools; 15 of the charters (19%) made the cut versus four of the district schools (5%). To be sure, that means that the vast majority of the charter start-ups remained in the lower half of student proficiency–and 40 percent remained stuck in the lowest quartile. But if you’re playing the odds, they look better for new charters than for turnarounds. Even if start-up charters are more likely to succeed than turnarounds, there currently are not enough of them available to kids stuck in failing schools. We simply don’t have the luxury of choosing charter start-ups over district turnarounds, because charters are nowhere near the scale that we would need them to be, especially in the neediest areas. If we want to “do something” about the very worst public schools in the country, we have to pursue a “both, and” strategy, not an “either, or” one. Still, one thing’s clear to me: it’s screwy for federal taxpayers to spend 12 times as much on school turnarounds ($3 billion) as charter start-ups ($250 million) when the latter appear to be four times more likely to succeed than the former. Team Obama: Wanna fix that? Who could argue with the importance of breakfast? It’s the most important meal of the day, right? I think that they actually found some evidence for that bit of folksy wisdom, by the way. At any rate, I thought that this article from NPR was pretty fascinating. I’ve pulled the whole text so it can be read in full; the audio link should work as well. We have seen this time and again at our school with high schoolers. So many of them come to school hungry and this causes them to spend more time thinking about where they can find food than about turning in their homework. The importance of breakfast cannot be downplayed. 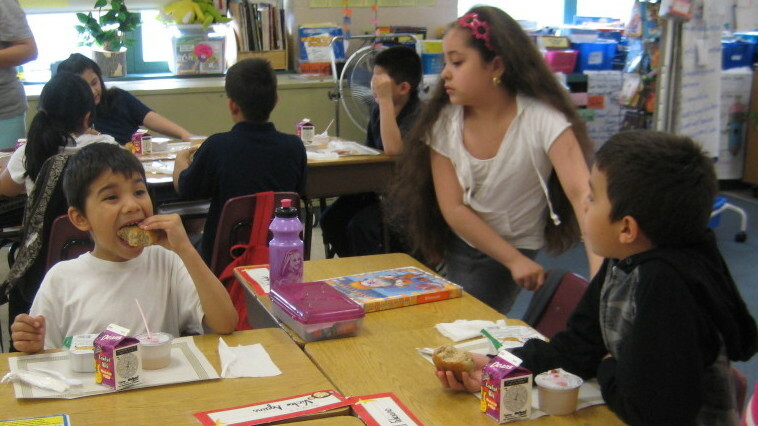 EnlargeLinda Lutton /WBEZStudents eat breakfast in the classroom at McAuliffe Elementary on Chicago’s Northwest Side. The school implemented the Breakfast in the Classroom program voluntarily three years ago. When students at Audubon Elementary stream into school, they are met just inside the doors by kitchen workers at tables in the hallway. On the tables is a sea of paper bags: white for hot breakfast; brown for cold. Soon, the second grade smells of cinnamon and warm syrup. Audubon is one of nearly 300 Chicago schools to begin serving breakfast in class this spring, as part of a district policy that says breakfast now must be served in elementary classrooms during school hours. Teacher Lourdes Valenzuela still starts the day by having kids read silently. Only now, a quarter of them also munch chocolate Mini-Wheats or scrambled eggs. Kevin Concannon of the U.S. Department of Agriculture says his agency is trying to get breakfast to every kid who needs it. Serving it in class does that. And, he says, studies show that eating breakfast helps with academics. Because my middle schoolers travel from class to class, I’ve got to worry about allergy and contamination in basically every classroom. The kid that spills may not have an allergy, but the student who comes in next period or the period after might. There are “fewer children coming to the nurse’s station with headaches, fewer children having problems concentrating on the work, fewer children falling asleep,” he says. The last schools in the district to implement breakfast in the classroom are coming online Thursday. 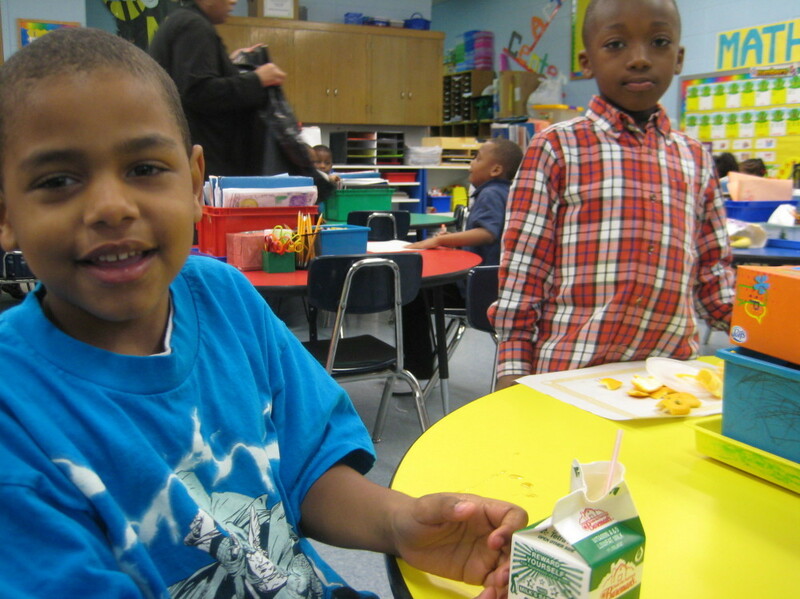 Chicago is the largest district in the country to mandate breakfast in all elementary classrooms. Until now, Houston was the largest school district to require all of its elementary and middle schools to offer breakfast in the classroom. Despite Concannon’s praise, however, the school board has received an earful from angry parents. Complaints range from the loss of school days to students’ food allergies and the program’s cost. At the Chicago schools that have recently started serving breakfast in class, early results show that the number of kids eating has gone from 26 percent of the student body to 62 percent. Critics say that doesn’t mean kids were hungry before — just that they’re eating now. Before Thursday, about 200 Chicago schools had already been serving breakfast in class. Complaints only emerged when schools like Audubon, with sizable middle-class populations, were required to participate. That has caused some to say opposition is class- and race-based, which critics deny. Audubon’s principal, John Price, acknowledges that he preferred the school’s former breakfast program, which was served in the cafeteria before school. Food allergies are a major concern: He has gotten permission to keep feeding fifth- through eighth-graders under the old rules. EnlargeLinda Lutton /WBEZAt Shoesmith Elementary on Chicago’s South Side, school officials say fewer students are tardy since breakfast service started. The school is 90 percent low-income. At Shoesmith Elementary, teacher Leola Stuttley says she initially opposed having her kindergartners eat in class, but after a month, she’s a convert. Fewer kids are tardy now, she says. At Shoesmith, where 90 percent of students are low-income, parents such as Noelle Jones feel torn between two things children need. “In a way it’s great because the kids get to eat breakfast in the classroom, and you could observe them, but it still takes away from the day, so maybe if there were a longer school day it’d be, like, just A-OK,” she says. Pressure has been building to lengthen Chicago’s school day, and breakfast may add to that. Meanwhile, Chicago’s new schools chief says he’s reviewing all of the district’s wellness programs, including Breakfast in the Classroom.